Wiltshire Police is the oldest police force in the UK with over 2,000 police officers and staff serving a population of around 684,000 people. 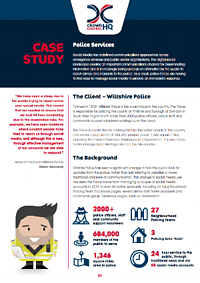 The Force experienced a steep rise in the public reporting crime via social media, and also recognised that the public increasingly turn to social media for updates from the police over traditional channels such as the website. This transformation to social media has seen the Force grow from a few accounts to over 68 social media accounts across Facebook and Twitter! Instantly respond to the public as people use social media to report crimes and incidents. Increase local public engagement online via 24 Neighbourhood Policing Teams and Community groups’ Facebook pages. Enable 15 Corporate Communications officers to access and oversee all social accounts, in addition to local police teams accessing their own Facebook accounts. Listen to online chatter around possible events or ‘sensitive topics’ happening in the community. Monitor and maintain an audit trail of all user activity and posts for all social media accounts. Download the case study now to read more!